Hella Handmade Creations is prepping for their June pre-order which takes place in just one week! June 14th-21st. 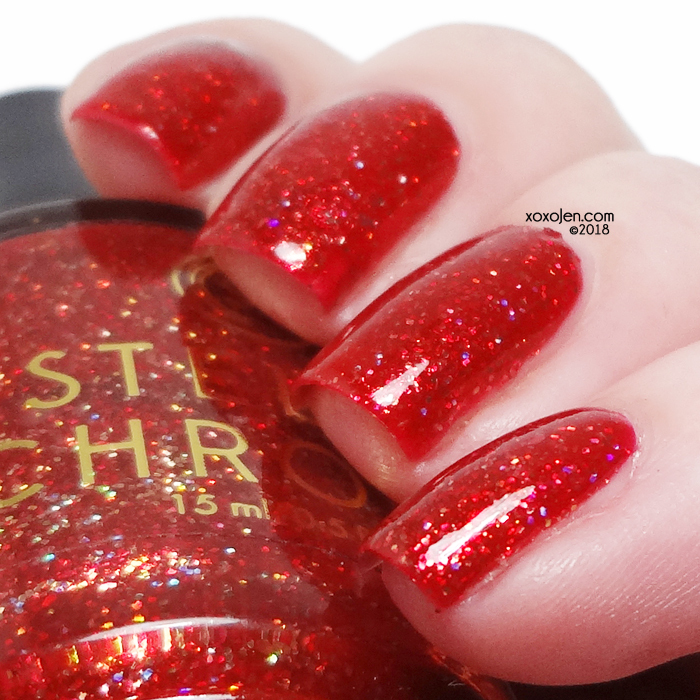 Polishes will start shipping by July 21, barring any unforeseen circumstances. In my review, I've included all the polishes I've received. Let's have a look! The Piemaker is a vibrant sky blue base with an orange to gold shifting shimmer (green at extreme angles) and holo flakes. Inspired by Pushing Daisies. Vibrant blue that shifts like woah. Fantastic formula and brush, opaque in two coats. 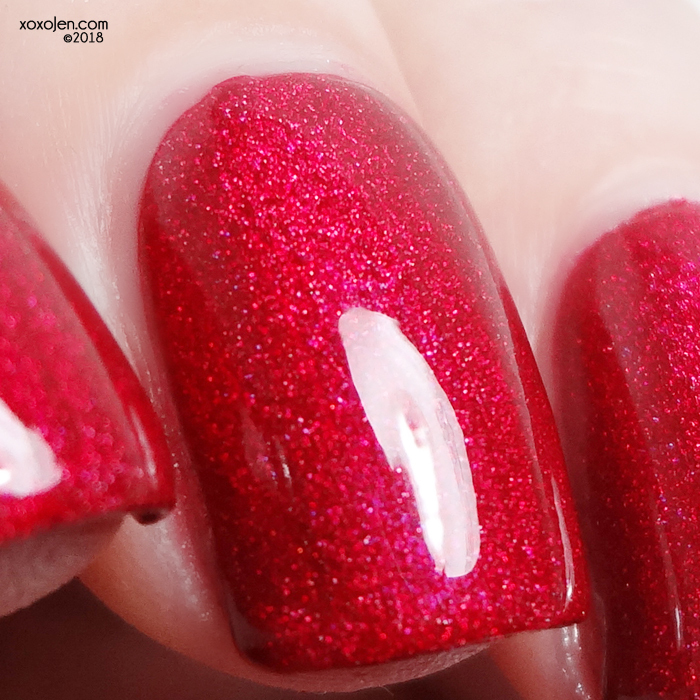 The Lazy Song is a bright cherry red glow holo. Inspired by Bruno Mars. A spectacular blue leaning red holo. Fantastic formula, opaque in two coats. Occupied Cities is a dusty pink with turquoise overlay, copper flakes and copper micro glitters. Inspired by Astro Boy. Loving the dusty pink with contrasting shimmer and copper flake. Fantastic formula, opaque in two coats. We're All Mad Here is a violet toned orchid jelly with red/green chameleon flakes, red/green aurora, chameleon iridescent glitters and holographic pigment. Inspired by Alice in Wonderland. That purple and those flakes had me at hello. Fantastic formula, opaque enough for my liking in two coats. Please note: The bottle for sale will be 15ML, rather than what's shown in my photos. 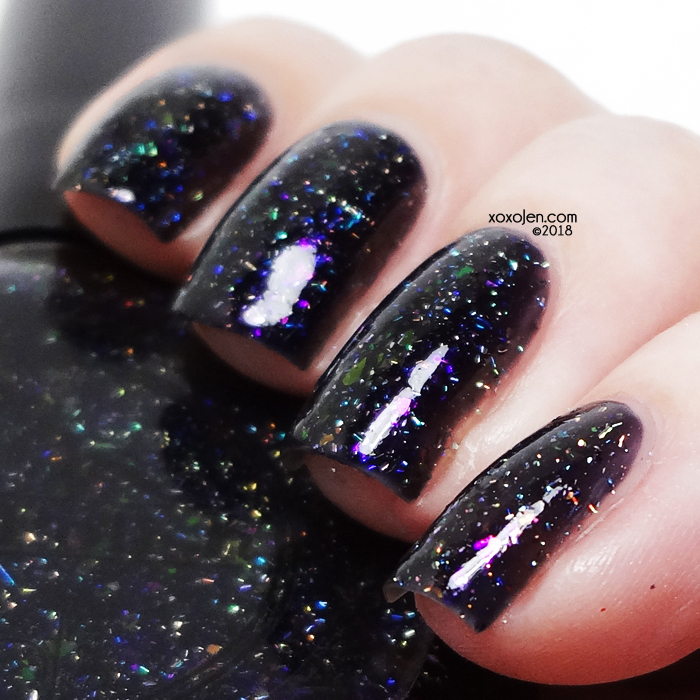 El is a dark blue base with a slight purple tinge, purple duochrome shine, and linear holographic particles and flakes. Inspired by Stranger Things. I love grey/purple combos. 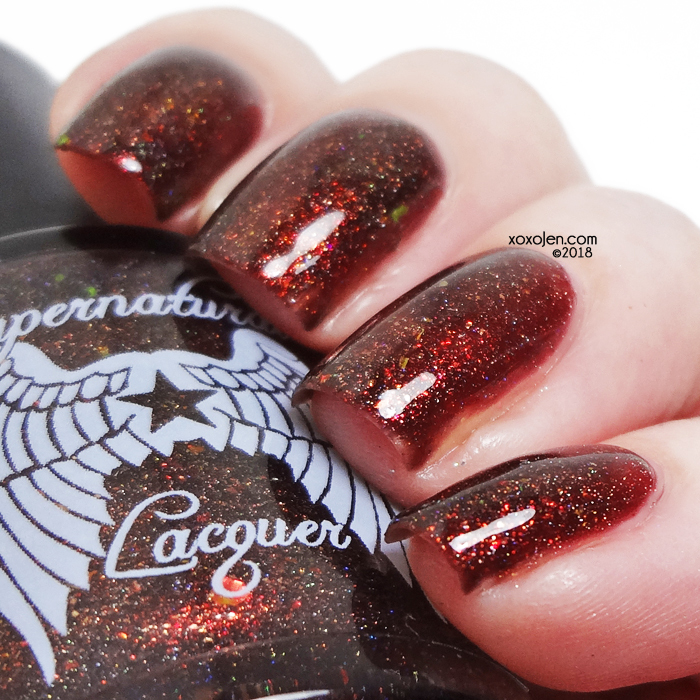 Fantastic formula, opaque in two coats. Addicted to Love is a sheer cool pink base with a strong red/violet to gold shifting glass fleck shimmer, a soft holo, and pink-gold-green colour shifting iridescent flakes. Inspired by the scene from Harry Potter where Hermione Granger and Ginny Weasley are looking at the love potions at Weasleys' Wizard Wheezes. Super shimmery and sparkly, it really twinkles in sunlight. Fantastic formula, opaque in two coats. Flash! Bang! Boom! 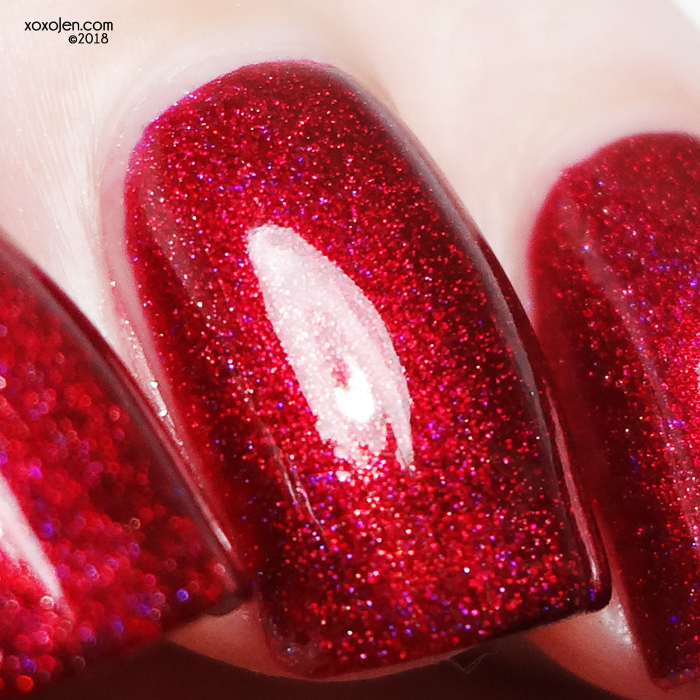 is a deep red linear holo with gold shimmer. Inspired by DC Comic's The Flash superhero. One coater with a fantastic formula. A Gem of Many Talents is a linear holo with a pearlescent-like effect created by an iridescent shimmer that shifts from teal to blue to pink-violet, filled with holo flake and iridescent flakes in blue-green-pink-gold. Inspired by Steven Universe. Has an ethereal iridescence that's hard to capture under bright lighting since the base is almost white. Good formula, opaque in two coats. 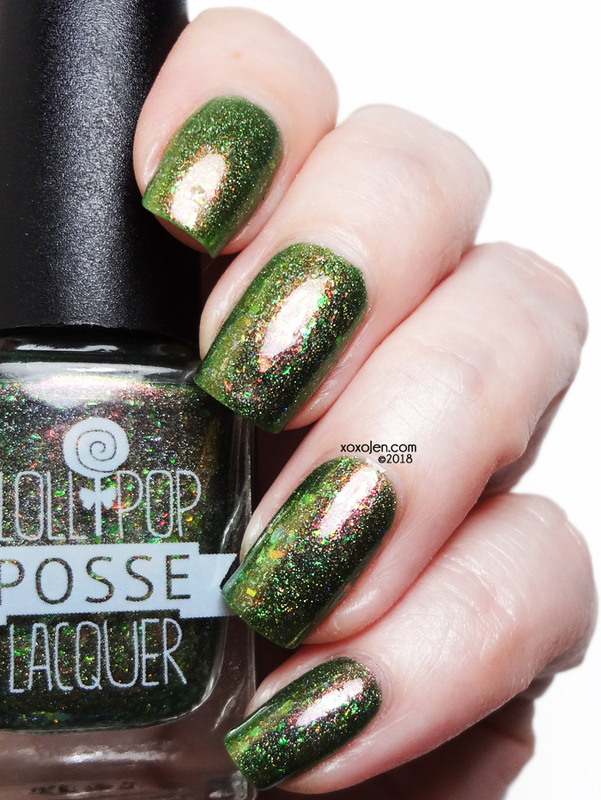 Swamp Water has a swampy green base infused with a fine linear holo pigment and loaded with a coppery, golden shimmer to represent a beautiful sunrise. Inspired by New Orleans. 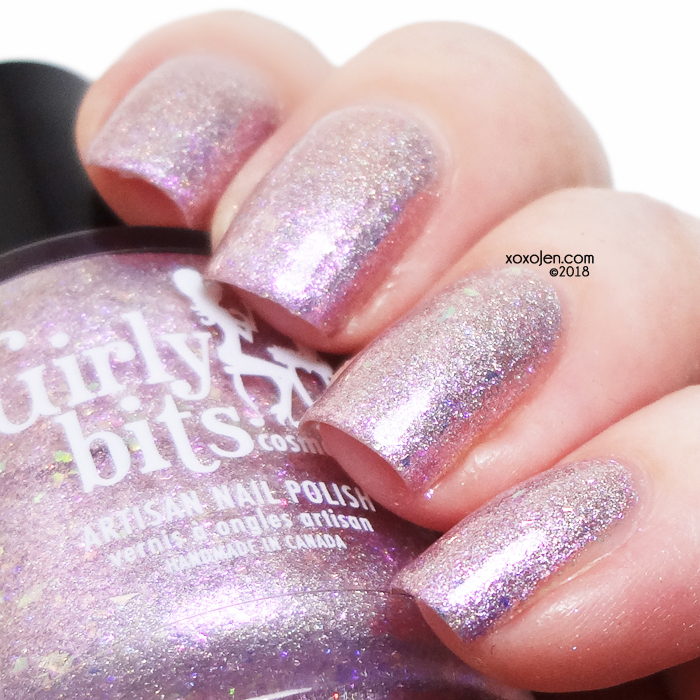 Love the hit of coppery shimmer and the effect of the holo makes it look 3D, super difficult to capture in a still shot. Fantastic formula, opaque in one coat. A bonus bottle shot to show the copper shimmer that I couldn't capture in swatch photos. 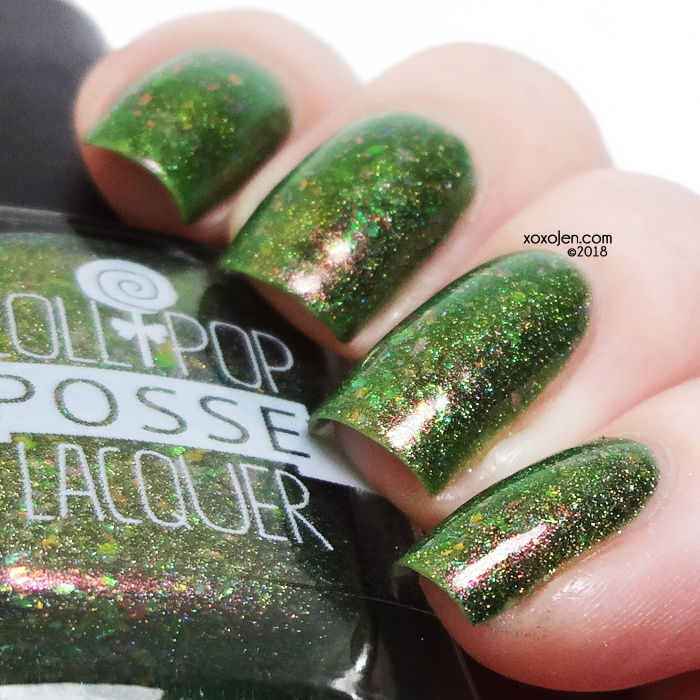 Sultry but Damaged is a forest green base with a burnt orange/red multichrome shimmer, scattered holographic pigment, and iridescent chameleon flakes that shift between aqua/green/purple and red/gold/copper. Inspired by Kady Orloff-Diaz of "The Magicians", and the apt (but also tongue-in-cheek) name assigned to her by Professor Mayakovsky during her time at Brakebills South. Is it green or copper or ? Such a morphing polish, Karen has really outdone herself with this! Fantastic formula, opaque in two coats. 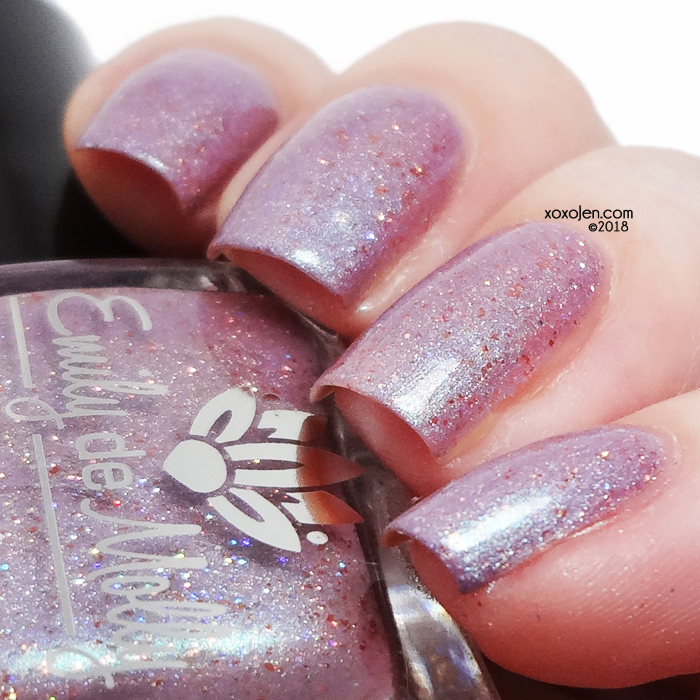 I Am NOT A Bunny is a magenta pink based holo with dark taupe sparkles and blue shimmers and glass flecks. Inspired by Aaahh!!! Real Monsters. Raspberry shades like this are my favorites, the blue sparks really make the polish pop. Fantastic formula, opaque in two coats. Poor Unfortunate Souls is a black jelly representing Ursula's dress with its gelatinous appearance. Holographic flakies, and purple translucent flakies to represent her skin. Inspired by Ursula, a female villain. 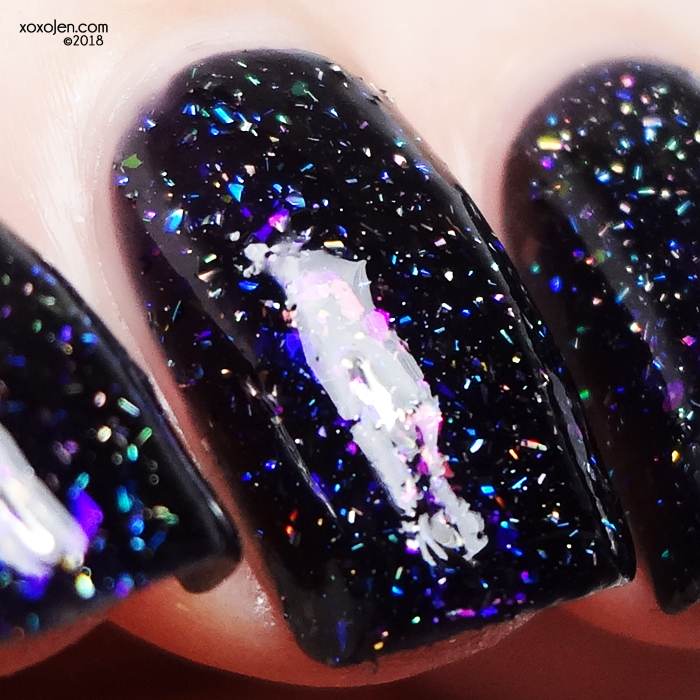 The flake and holo are super bright and not hindered by the dark base at all. Magic in a bottle. 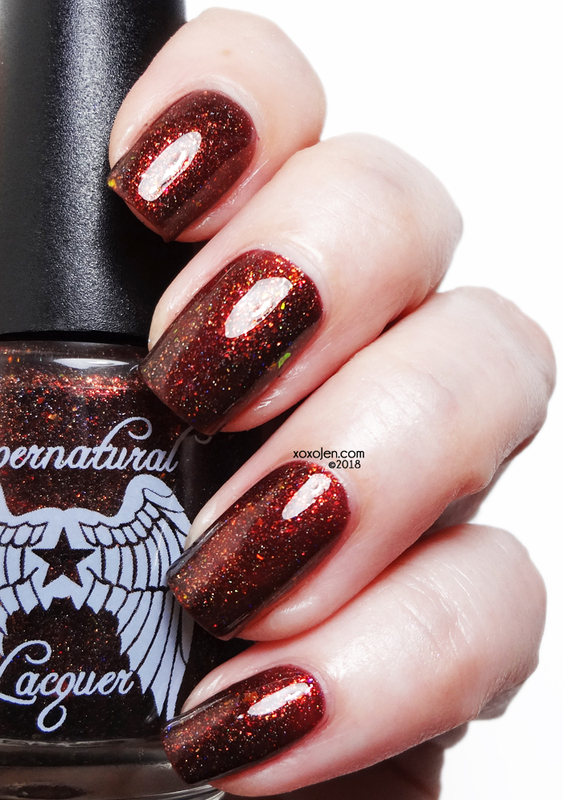 Fantastic formula, opaque in two coats. Indigo On Your Chiclets is a medium blue crelly with a purple shift, scattered holo effect and subtle iridescent green flakes. Inspired by NBC's Parks and Recreation. The purple shift was tough to capture on camera/studio lighting but is definitely there under sunlight. 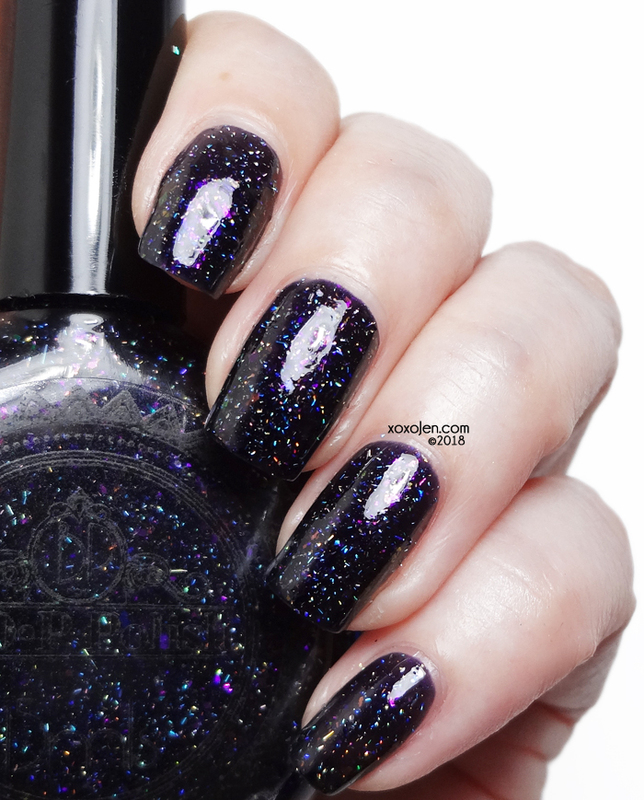 Fantastic formula, opaque in two coats. 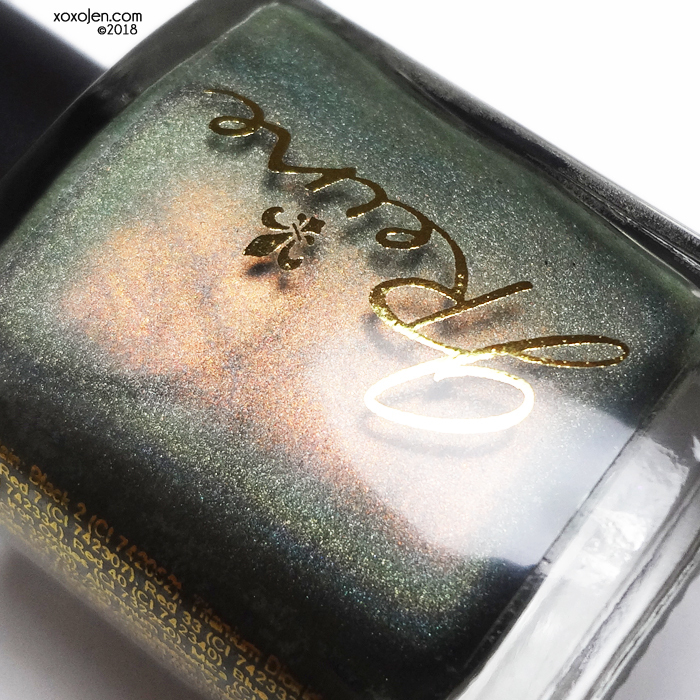 The Power of Love is an almost-turquoise green holo with vibrant violet sparks. Inspired by Studio Ghibli. Loving the contrast of the sea foam green and purpley shimmer. 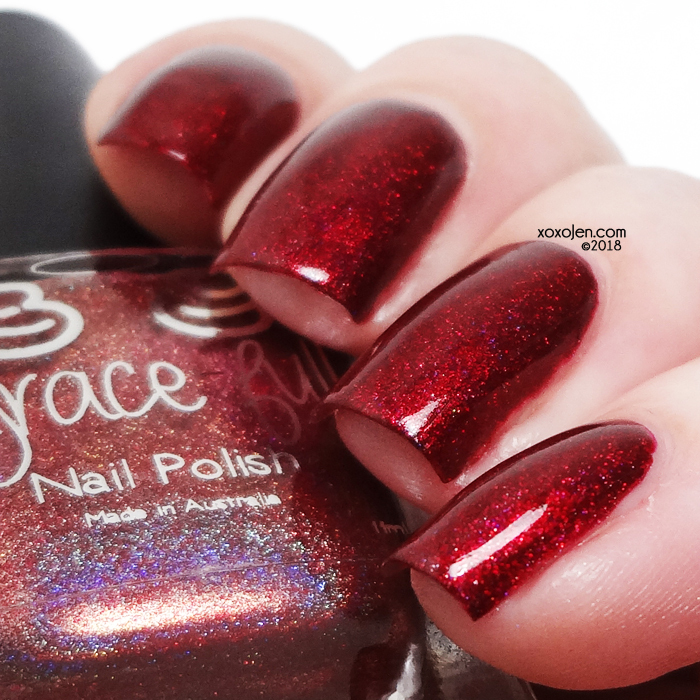 Fantastic formula, opaque in two coats. Chase is a lightened, dusty eggplant purple linear holo with copper sparks and red/blue shifting pigment. Inspired by My So Called Life. 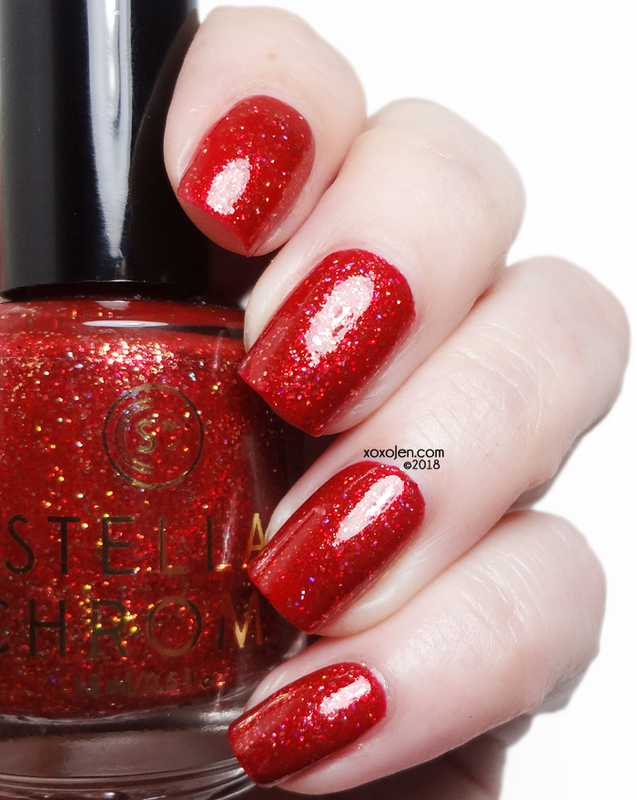 The hits of red from the holo flame really catch my attention. 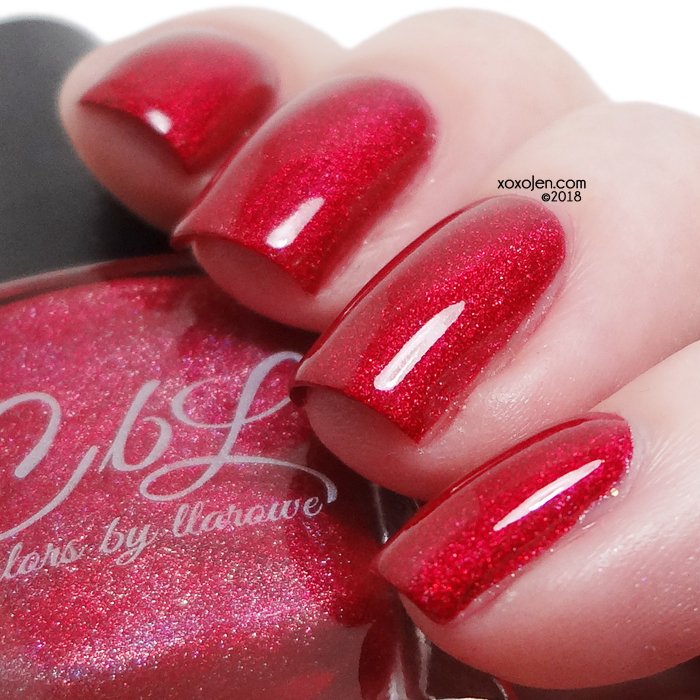 Fantastic formula, opaque in two coats. 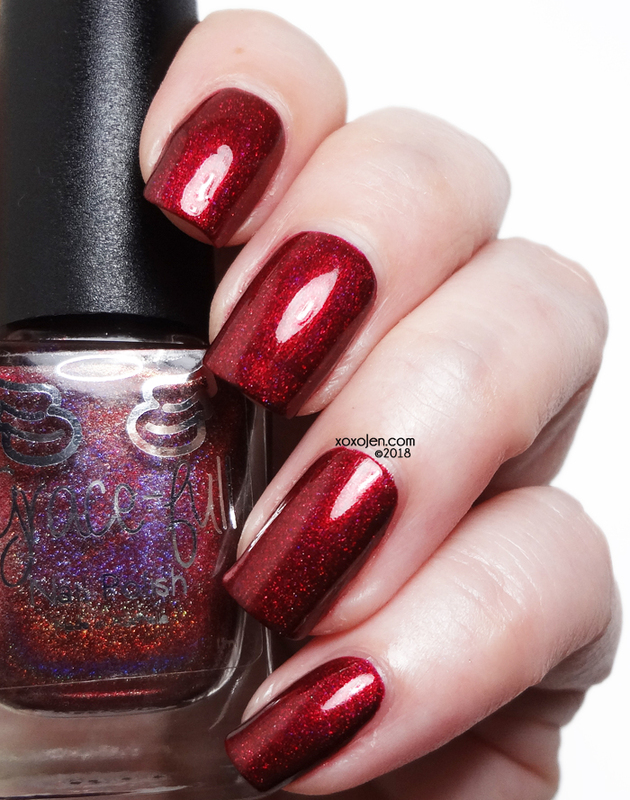 Queen Regent is a crimson jelly packed with gold holo glitters and gold metallic micro flakies. Inspired by Game of Thrones. 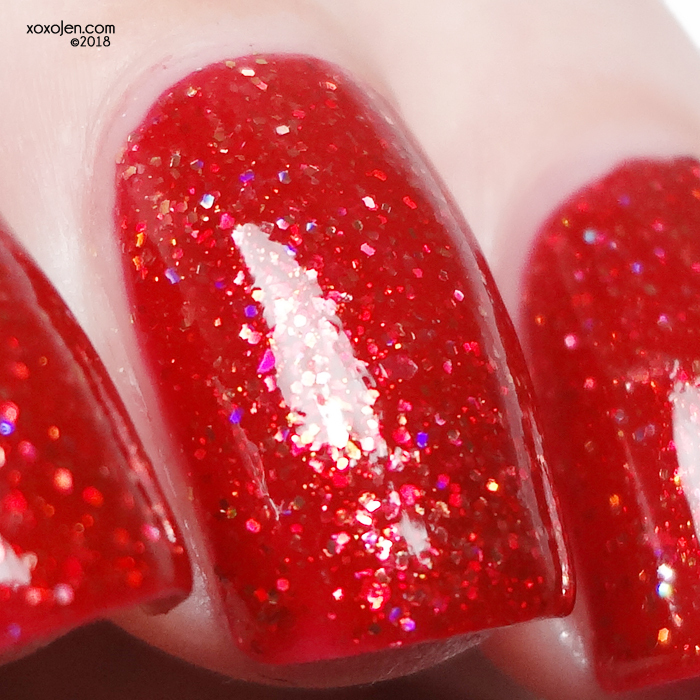 Squishy and glittery, this is a true red. Fantastic formula, opaque in two coats. 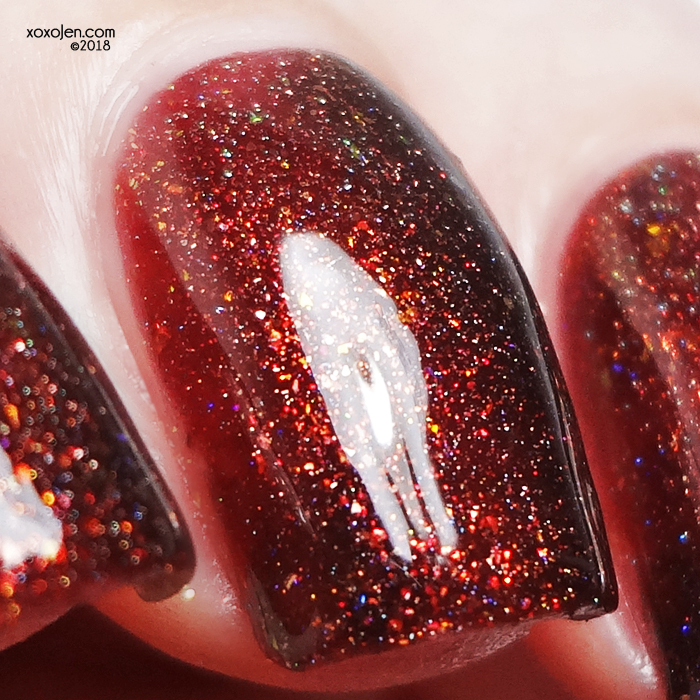 Big Damn Heroes is a deep rusty red with red/green aurora shimmer, a mix of red/copper/green color shift flakes, bronze micro flake and a semi linear holo. Inspired by Firefly. The shift in those flakes against the base color is stunning. Fantastic formula, opaque enough for my liking in two coats. You Won't Like Me When I'm Angry is a hulk green linear holo polish with purple shimmer, gold/green chameleon flakies and silver micro glitter. Inspired by Marvel Comic's The Hulk. Love how this one shifts! Fantastic formula, opaque in two coats. Gemini is a pink/green/gold colour shifter with purple/blue/green/teal multichrome flakes and blue/green/pink/purple white chameleon flakes inspired by The Magic of the Zodiac. Super sparkly and reflective, and quite smooth for how much it has going on in it! Two coats shown with topcoat. What are you adding to your wishlist?! Available at Hella Handmade Creations June 14th-21st. Wallet is doomed! I want them all!